Love Varnish: Swatches & Review - 4 shades from the Lekker Lacquer Winter/Holiday collection! Swatches & Review - 4 shades from the Lekker Lacquer Winter/Holiday collection! Hi loves! Today I am introducing you to a brand new indie brand that is produced right here in The Netherlands: Lekker Lacquer! The word "lekker" means as much as nice, delicious or yummy and you pronounce it quite similar to the word lacquer, a very clever and fun name for a polish brand! The brain behind this indie is Angelique, you might know her from the blog Meisie's Nails. A while back she contacted me asking if I'd like to review her polishes and I agreed. The first collection she created is inspired by both the Winter season and the holidays around it. It consists of 8 polishes, I am showing you 4 now and will show the others later. These are all glitters, some meant to be layered and others can be worn by themselves. The bottles are rectangular ovals (does that make sense? ), a white brush cap holding a small flat brush (I like!) and they are branded with a logo sticker on the front (clear with silver typography) and a white sticker with the polish name on the bottle. All Lekker Lacquer nail polishes are 5-Free, that is, free of DPB, formaldehyde, formaldehyde resin, toluene and camphor. Furthermore, the materials used are cruelty-free, vegan and EU approved. Let's take a look at the first 4 polishes, shall we? Can't Bear The Cold is a sheer blue jelly filled with frosted white glitter in various shapes and sizes. Application wasn't easy as the base is very sheer, and because of the glitter even distribution is hard. This causes the color to look patchy. I used 3 coats and a layer of Gelous. The depth in this is very pretty but the shade of blue isn´t my favorite. I´d layer this next time over an opaque blue base. Chimney John is a red crelly filled with white glitter in various shapes and sizes. This has some neon qualities it seems! The base is both sheer and very opaque at the same time, the pigment is really intense but you can still spy the glitter in the bottom layer. I needed 2 coats and a layer of Gelous, once you have a good first layer (bit tricky with the enormous amount of glitter - I always struggle getting it close to my cuticles without pooling them) the second isn't tricky anymore. This reminds me of HARE Polish A Positive but on drugs, lol! Did It Rein, Deer? 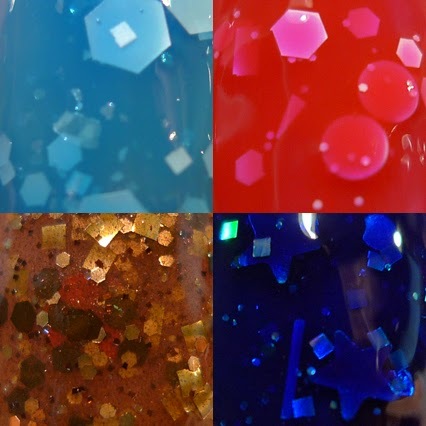 is light brown jelly loaded with brown hexes, caramel hexes and squares, red dots and bronze micro glitter and shimmer. This is SUCH a cute polish! Yes, it's brown, but it is inspired by Rudolph the Rednosed Reindeer ♥! It even has red circle glitter! I used 3 coats by itself topped with Gelous but recommend layering it, because the glitter builds up too much this way in my opinion. The only thing I don't like about those circle glitters is the way they can stick out from the side of your nail when you have curved nailbeds. Other than that, a winner for me! 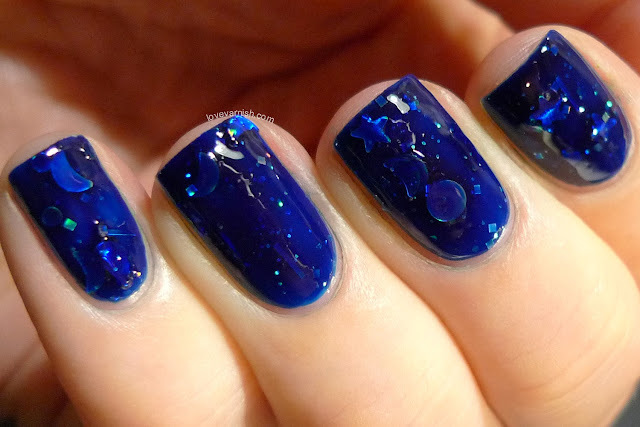 Santa's Curfew is a dark blue jelly loaded with holographic silver moons, stars, dots, bars and hexes. This has AMAZING depth. The glitter really sparkles beneath the surface and I can even appreciate the shaped glitter (the only shaped glitter I liked so far was Too Fancy Lacquer Plethora Of Love). It does apply.. though. The glitter tends to clump together so I tried to grab some blue polish first, then pick up some glitter and place it where you want, after the first coat dried apply your second the same way. I finished with 2 coats of Gelous. Yes, it takes some time, but it is a pretty result, right? Which of these is your favorite? Tell me in the comments! Lekker Lacquer is a hand-blended Dutch indie brand, you can find more information on Facebook and Instagram. The polishes retail for $8,31 (€5,90) and if you buy any 8 bottles the shipping is FREE worldwide! Check out her Etsy shop for more about this deal. Lovely swatches! I won two of these (Santa's Curfew and Chimney John) and I'm so glad I picked them especially after seeing your swatches. :) I can't wait till they arrive. Bear the cold is my fav! can't wait to see the other swatches. Hopefully I can swatch them tomorrow!